A totally unrelated picture posted to Flickr today by fellow Liuzhou blogger and photographer, Expatriate Games reminded me of this. A few weeks ago, I found myself in an unaccustomed part of the city. It’s not far from my usual haunts, but involves crossing the river, not something I do very often (it’s a living in London relic). But I needed to make a purchase and the only shop which seemed to offer what I wanted was in that area. They specialise in light industrial equipment – and I prefer my industry to be light. It was a pleasant afternoon so, instead of my usual habit of jumping into the nearest taxi, I went for a stroll across this monster. 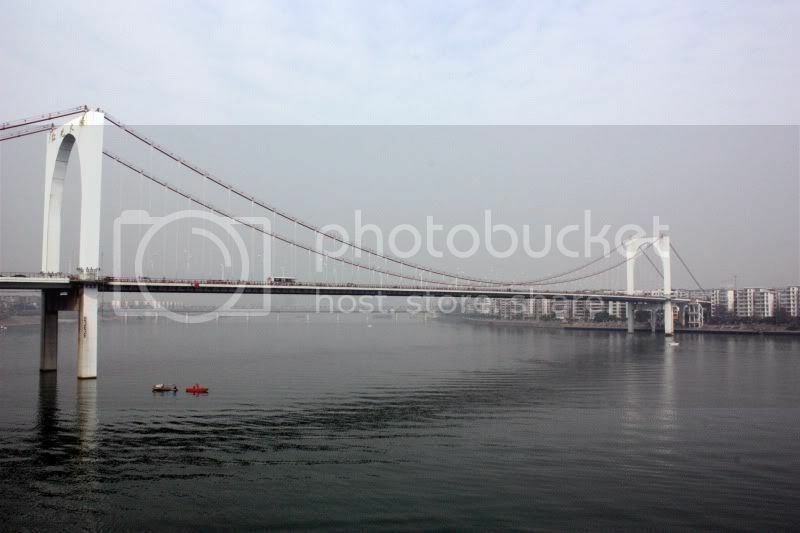 This is Hongguang Bridge, one of the more recently completed bridges across the Liujiang. I’ve lost count how many there are now. The oldest only dates from 1968 and when I came to Liuzhou there were only two or three and the ferry was still running. They are still building more. But this one really improved things. Instead of a trip from home to the railway station taking approximately a week it now takes about 15 minutes. Anyway, I walked across it admiring the views of other bridges and made my necessary purchases. It is not the prettiest area of the city, but vibrant in its own commercial / industrial way. For reasons which totally escape me, I decided against all the odds to catch a bus back. I very seldom use buses. What was I thinking of? So, there I was standing at the bus stop. Chinese bus stops are cool. Full of information. Every stop has a name – usually related to some nearby landmark. This can be the name of a park or a hospital or a factory. I often catch buses at a stop called No. 23 Pillow Factory (well that is a complete lie, but you get the idea). 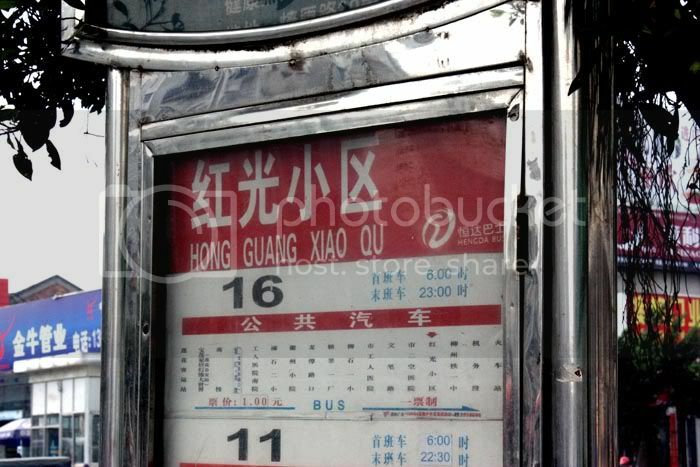 There was for many years a bus stop in downtown Liuzhou called “Muslim Restaurant” despite the face that the restaurant in question had closed years before. They solved the problem, not by renaming the bus stop, but by reopening the restaurant! So, there I was still standing at the bus stop. Besides the name of the bus stop, the sign also informs you of which buses are likely to stop there and lists the full itinerary of each bus, the frequency, the cost and the times of the first and last bus. There is even a little arrow telling you which direction buses go from this stop. So, there I was still still standing at the bus stop. To pass the time (maybe they got the frequency wrong), I examined the bus stop sign – there was nothing else to examine. It amuses me to attempt to practice my Chinese reading from time to time. It is still pretty rudimentary, but it is a while since I used the wrong lavatorial premises (although they tend to be bi-lingual these days or at least have stylised pictures of men and women). To my everlasting amusement, they too had translated the stop in question as “Red Light District” Red light district in Chinese is the slightly different 红灯区 hóng dēng qū.
. This entry was posted on Tuesday, August 31st, 2010 at 9:01 pm	and is filed under About Liuzhou, Humour, Liuzhou Life. You can follow any responses to this entry through the RSS 2.0 feed. Both comments and pings are currently closed.